Stayed here one night on business. Old buildings and small rooms, limited facilities (only one beer on draught) limited menu and breakfast options. But very quaint, good style and nice food. We ate dinner in... Stayed two nights - oldy worldly hotel - especially the common area. Bed was so narrow it was a challenge to sleep in it. We were in the roof which was quiet - if very hot! Great location - breakfast plentiful! Don't let that put you off, the bed was comfortable, the shower warm, and the TV had a reasonable choice of channels, whilst the Wi-Fi was free and worked well. Best hotel in Krs!! 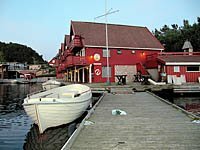 Get quick answers from Trysnes Marina & Feriesenter staff and past guests.